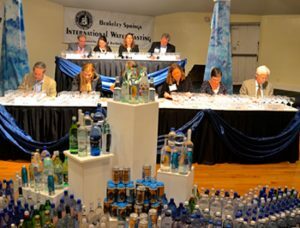 BERKELEY SPRINGS, WV —– The Berkeley Springs International Water Tasting, the world’s most prestigious, gave out awards tonight to waters from three continents. All five continents had waters among 112 entered. The municipal water category was a battle of champions with the water judged best in the world for 2019 — Clearbrook, British Columbia, Canada – also the biggest medal winner in the event’s history. The best water in the USA is Eldorado, CO, gold medal winner in 2016, along with the silver medalist from first-time entrant Hamilton, Victoria, Australia. The bronze winner is previous medalist, Independence, MO and 4th is another repeat winner, Desert Hot Springs, CA. For the first time, Berkeley Springs water won, placing fifth. The Best Bottled Water category had one return medalist and a vintage winner from the earliest days of the event. The gold medal went to Smeraldina Natural Artesian Water, Sardinia, Italy with the silver going to long time event supporter Grand Springs, Alton, VA. The bronze went to a first-time entrant Mount Pure Natural Mineral Water from St. George’s, Grenada, West Indies. Castle Rock Spring Water, Dunsmuir, CA is a former medalist and placed fourth. The fifth place winner came in cans, a first for the event and quote popular with the audience. Little Swiss, Gap Mills, WV is bottling water from Sweet Springs, WV, one of the event’s first repeat winners in the early 1990s. The audience was filled with water enthusiasts coming from as far as Australia and British Columbia. Ten media judges spent hours tasting and selecting from waters sourced in 14 states, five Canadian provinces and eleven foreign countries. “There were waters from two new countries this year: Grenada and Taiwan. They joined waters from Turkey, Bosnia, Greece and Australia” said Jeanne Mozier, an event founder. Sparkling waters are sourced from three continents and include mostly new winners. Gold medalist is a first-time winner, Mountain Valley Spring Water Sparkling, Hot Springs, AR. The silver medalist is a multiple past winner, Touch Sparkling Mineral Water, Marchand, MB, Canada. Bronze was won by Oravida Natural Artesian Water, Otakiri, Whakatane, NZ. Fourth places is BLVD, Yolla Tasmania, Australia while fifth is a tie between OGO Sparkling Water, Sandilands, MB, Canada and Waiheke Minerals, Waiheke Island, New Zealand. Purified waters are a relatively new addition to the water world, often municipal systems bottling their water. For the first time ever, hometown Berkeley Springs Purified Water, Berkeley Springs, WV won the gold medal. There was a tie for the silver medal with Waiheke Mineral Plus, Waiheke Island, New Zealand and Lesage Water, Lesage, WV. The bronze went to Ophora Water, Santa Barbara, CA and fourth place is Waiheke Still, Waiheke Island, New Zealand. “It was another wonderful year for the longest running and largest water tasting in the world,” said von Wiesenberger. “Berkeley Springs is the Academy Awards of water.” He also praised the selection of the Lifetime Achievement Award to Joe Doss of the International Bottled Water Association and welcomed participation of the award sponsorship by WaterExpo of Guangzhou, China. The crowd was interested in two peoples’ choice categories where it was their votes that chose the winners. The packaging category had 16 entrants, the most ever, competing for most alluring. Svalbaroi Polar Iceberg Water from Longyearbyen, Norway won the gold for the third year in a row. Silver went to Waiheke Minerals, Waiheke Island, New Zealand. Bronze is Iceberg Water, Lewisporte, NL, Canada, fourth is Oravida Natural Artesian Water, Otakiri, Whakatane, NZ and fifth is also from New Zealand where they take packaging seriously. Antipodes, Otakiri, Whakatane, NZ is a repeat winner. Flavored Essence Sparkling Water was a new category in 2018 and the number of entrants doubled this year. The crowd’s favorite was Mountain Valley Blackberry Pomegranate Sparkling Water of Hot Springs, AR. The silver medal went to OGO Lime Sparkling, Sandilands, MB, Canada. Mountain Valley also won the bronze with White Peach Sparkling Water. The ten media judges selected by Klein Rone included representatives from various regional and national media including television, newspapers and online magazines. They were instructed by von Wiesenberger to look, sniff and taste each water under guidelines similar to those in a wine tasting. The waters were rated for each attribute including appearance (it should be clear – or slightly opaque for glacial waters), aroma (there should be none), taste (it should taste clean), mouth feel (it should feel light), aftertaste (it should leave you thirsty for more). Waters were tasted in four separate flights over two days. “The judges job is crucial and so is their training,” said Mozier. “We present all our judges with a diploma designating them as a Certified Water Taster.” Mozier also noted an exciting part of this year’s event – Adam Ridley’s Bumbleton Films spent three days filming, interviewing and absorbing the event. The 30th annual Berkeley Springs International Water Tasting is scheduled for Saturday, February 22, 2020. The event seminar on Friday and Saturday’s award ceremony were live streamed on the Berkeley Springs, WV Facebook page operated by the Morgan Arts Council’s Digital Media Center. For more information on Berkeley Springs or its water tasting, call 1-800-447-8797 or check the website.